"Resort Cafe KAI" (Okinawa, Japan) is located on a beautiful beach called "Chura-SUN" about 10min.-drive from the Naha airport. With terrace tables offering a panorama view of the ocean and blue sky, and sophisticated interior designed by a famous architect, this cafe offers an elegant atmosphere and also a casual beach-side air. The cafe ishighly-reputed from travelers to locals for delicious foods and wide variety of drinks in a perfect location. 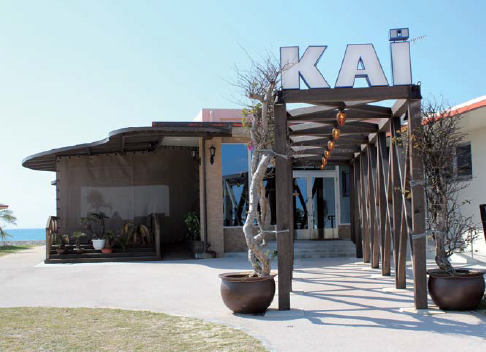 Resort Cafe KAI introduced a cloud based POS/order entry system (OES) called FLAVIUS provided by Global Network Service, INC. Under a wireless LAN environment in the cafe, an iPod touch is used to take orders and an iPad for the register. For receipt printing, EPSON TM-T70-i is used, and for printing orders to the kitchen, TM-T90 are located at the kitchen and bar. FLAVIUS offers a dedicated woodgrain case which can house the TM-T70-i and the cash drawer, so the counter is neat and uncluttered. The atmosphere the cafe offers its customers such as a beachside location or the interior design is really important to Resort Cafe KAI. This extends to the POS/OES devices which customers may see, so it wanted to use devices that were also smart and did not spoil the cafe's atmosphere. FLAVIUS made it possible. The cafe's manager Mr. Satoshi Ito said about the merit of general purpose devices and the reason to introduce the system, "iPad and the POS in the dedicated case are well designed and space saving. Taking orders using iPod touch is also very smart and highly stylish, and this system really fits our shop's image." "It is compactly designed in a black case and fits the design of FLAVIUS and the atmosphere around the cash counter. "; the manager also highly appreciated TM-T70-i and said, "I can give a passing grade in usability and functions such as beautiful print, excellent paper cutting, and easy-to-exchange paper rolls." Actually felt the benefits of general purpose devices. The shop manager Mr. Satoshi Ito said about the merits of general purpose devices, "For the shop management, the greatest benefit is that there is no need to teach the staff how to use the devices. Most young staff members are used to the operation of general purpose devices such as smart phones, so they can get used to how to use themquickly if you let them use the devices freely. I feel that the staff can get into the real operations sooner than when using traditional devices. Another great benefit is their design - they are really stylish. I really focused on the interior design. I felt the traditional POS terminals which looked like a machine were not fit for this cafe, so I'm satisfied with this fashionable and smart POS/OES using iPad." EPSON is a brand I can trust. "I think everyone associates printers with EPSON, so EPSON is a reliable brand. TM-T70-i offers beautiful print and the printed characters are really sharp. The color of the printer and its design are excellent and fit for the shop's atmosphere. TM-T70-i is easy-to-use. Exchanging paper rolls is one-touch and takes just about 10 seconds. It saves a lot of time." 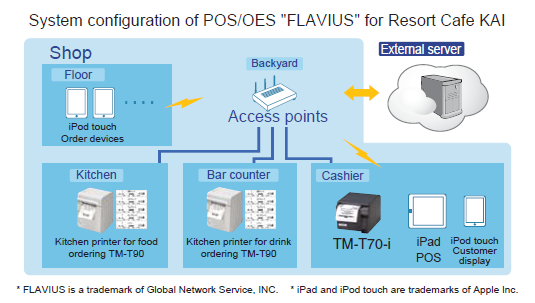 The general manager of Global Network Service, INC, Mr. Yoshitaka Kitai said about this system, "FLAVIUS is a new POS/OES system with a concept of changing the design of the environment where the POS system is used. Having general purpose devices such as iPad and iPod touch for the POS and order entry terminals and providing a dedicated case to make the counter neat and orderly, you can install a brand new system in a stylish design that is different from the traditional POS at a lower cost." "The decisive factor in selecting TM-T70-i is the server direct function(Server Direct Print). TM-T70-i periodically obtains the print data from the Web server, so the printer makes the direct printing from the Web server possible, which was previously very difficult to achieve. Thanks to this system, there is no need to install the printer server PC in the shop, so the system can reduce costs and it is more stabilized. 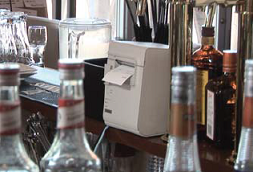 TM-T70-i is an essential item to realize a cloud-based POS system. TM-T70-i satisfies me in terms of reliability and perfectly matches with the cash drawers and other device cases we produce. For these reason TM-T70-i is an ideal printer for FLAVIUS and I would like to continue this good partnership going forward.